An excellent device for implementing ecosystem management, and also protecting listed species, is the Site Conservation Planning (scp) process. It is a tool for transferring the science-based, adaptive framework of ecosystem management into a clear set of goals and strategies for a base's conservation program (TNC 2000). The process is outlined in detail in The Nature Conservancy's publication, The Five-S Framework for Site Conservation: A Practitioner's Handbook for Site Conservation Planning and Measuring Conservation Success, which can be downloaded at http://www.nature.org/summit/files/five_s_eng.pdf. Also included is a case study of the application of this process at AAFB. The "Five Ss" are Systems, Stresses, Sources, Strategies, and Success (TNC 2000). developing measures of success related to the conservation goals for the site. At Arnold AFB this process is used as a planning tool to develop goals and objectives for the INRMP. The planning process involves stakeholders to insure that realistic conservation goals are developed, all threats are considered, and strategies for achieving goals are feasible (TNC 2000). At AAFB, stakeholders are involved in a series of meetings for which they are prepared ahead of time with the topics to be discussed. Among others, the local USFWS Ecological Services Field Office and state wildlife agency are included as stakeholders in the planning process, particularly when discussing threatened or endangered species. When these organizations receive draft copies of the INRMP for review, they are already familiar with the content, as they had assisted in its development. This made the required INRMP Sikes Act coordination a smoother process. 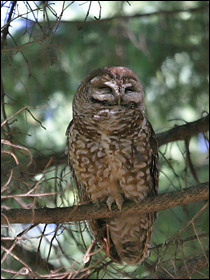 A listing of bird conservation regions can be found at http://www.nabcius.org/map.html. Before proceeding further, it is important to assess the focal targets' current health. The assessment is based on three factors: size, condition, and landscape context (TNC 2000). Thus the first "S" is systems, which TNC defines as "the conservation targets occurring at a site, and the natural processes that maintain them, that will be the focus of site-based planning." Threats to the conservation targets must be identified after assessing their viability. Threats are defined by the stresses (the second "S") affecting the targets and the active and/or historical sources (the third "S") of those stresses. The stresses and their sources are combined to define the threats to the conservation targets  e.g. mowing instead of burning lands where Eggert's sunflower grows. Developing strategies (the fourth "S") for abating all the stresses affecting the focal targets may not be practical. It's best to review the sources, many of which are common to multiple stresses and targets. Next, rank the active threats (i.e., active sources of stress) for focal targets; next, determine how each active threat affects focal conservation targets, and then begin developing strategies for reducing primary threats. Developing strategies for the highest ranked threats should provide the greatest return on investment (TNC 2000). 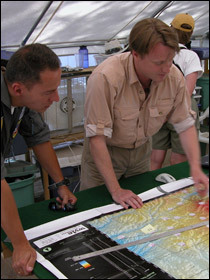 Strategies are implemented as goals, objectives, and projects in the INRMP. Success (the fifth "S") is measured though monitoring (populations, acres burned, wetlands restored, etc.). Monitoring is a subject that can and has filled numerous volumes and is too broad a subject to cover here. However, the importance of this last step cannot be overemphasized. It serves as the primary feedback mechanism in an adaptive management program. John Lamb is a conservation biologist. Kevin Willis is a plant ecologist. George R. Wyckoff is a wildlife ecologist at Arnold AFB, Tennessee. Click here to view literature cited in this chapter. Click here to download Chapter 6 as a PDF.